The end of a single wire rope is bent back along the rope to form the eye, and strands are hand-tucked into the body of the rope in what is called a Wallis Splice. This splice is tapered and concealed by tucking strand ends into the rope, making a sling that is easily pulled through narrow spaces; there are no rough ends to snag hands. The Wallis Splice utilizes tension in the rope body to secure strands where they are tucked back into the rope. Needs no metal sleeve to assure firm anchoring. 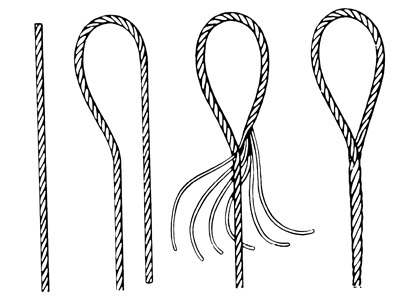 When “tapered and concealed”, ends of strands are tucked inward and concealed inside the rope. WARNING: Hand-spliced slings should not be used in lifts where the sling may rotate and cause the wire rope to unlay. For a single leg hand spliced sling with loop on each end, with rated capacity of 1.8 tons vertical, 12 ft. long. ORDER: One 1/2″ diameter type HS-1-1, 12 ft. long. * Rated Capacities for unprotected eyes apply only when attachment is made over an object narrower than the natural width of the eye, and apply for basket hitches only when the Did ratio is 10 or greater, where D=Diameter of curvature around which the body of the sling is bend, and d=nominal diameter of the rope.